Static Load Capacity – 35,000 lbs. Butler Stiff Leg Supports are used on tanker trailers, dump trailers, utility and construction trailers. The design allows you to support your trailer by easily pulling and replacing a pin. 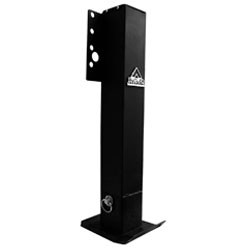 While these trailer supports do not offer lifting capacity, their quick operation is favored by a number of users.